Real Madrid truly have a special young talent on their hands in Vinicius Junior as he becomes more of a regular in their first-team this season. The 18-year-old Brazilian looks more and more comfortable in their senior side with every passing game, and he put on another fine display against Atletico Madrid yesterday. 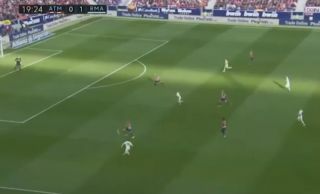 Los Blancos won 3-1, and though Vinicius did not get on the score-sheet, he produced one real eye-catching moment with this outside-of-the-boot pass to set up Lucas Vazquez for a chance.